California-based Control VR wants to change that. The company today launched a Kickstarter for its Control VR wearable device, a glove-like system that fits over the user’s arms and shoulders and can accurately sense the precise movements of fingers before translating that motion into virtual or augmented realities. Unlike motion sensing controllers such as Microsoft’s Kinect, the Control VR can map precise arm and finger motions without the use of an external camera. Alex Sarnoff, Control VR’s co-founder and CEO, says “existing motion-sensing technology is crude, insufficient and limited by confined spaces and camera systems.” His company’s solution takes up little space and doesn’t require an external device pointed at the user. Instead, fine control is made possible by a set of tiny sensors that are placed on the user’s fingers and arms. Each of these sensors — which Sarnoff says were designed for military purposes — has three accelerometers, three gyroscopes, and three magnetometers. The data produced by the position of these sensors is fed back to a processor that allows the Control VR system to calculate how the wearer’s fingers are moving in relation to their body. Sarnoff sees his company’s device first being used with video games. Control VR has already demonstrated its device being used with the Oculus Rift headset, using the Rift’s Tuscany demo to show how hands, arms, and fingers can be manipulated by the player. The sensors on the wearer’s elbows and fingers mean that the motions look natural on screen, appearing as one-to-one representations of their actions in the real world. 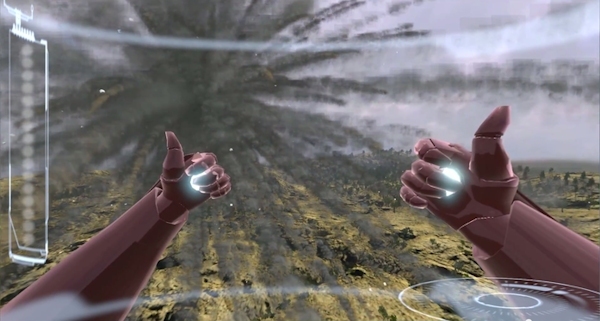 In a newer demonstration, also using the Rift, a player places his hands behind his back to send an Iron Man avatar flying across treetops. He throws his hands forward, using Tony Stark’s palm-mounted thrusters to come to a hovering halt, before pointing his fingers at flying opponents and blowing them from the sky with his suit’s weapons. The most recent renders of the device show it sporting a small joystick, but Sarnoff says the system will also have more humanitarian uses than aerial video game battles. Control VR will ship with an SDK that Sarnoff says will allow developers to “make the world a better place” by building software and adding functionality for the technology. “Ultimately, functional applications like remote physical therapy and virtual sign-language will be developed,” he says. Sarnoff thinks his company’s device will have a major impact in the animation, design, medical, and robotics communities — and with the party game crowd. “Imagine playing a game of beer pong in real-time,” he suggests. The company’s funding goal is set at $250,000. Those that pledge $350 — the same price as an Oculus Rift development kit — or more get their own Control VR system, in addition to its SDK and a set of tutorials that the company says makes “integration with any 3D game or application as easy as possible.” Sarnoff promises that those that do purchase a Control VR system won’t have to buy a newer version six months down the line. The $350 device is modular, meaning new features and functions can be slotted or patched in later. He mentions haptic feedback as one example that will “absolutely” be a part of future versions of Control VR, “so gamers can play with real feedback while laying on a sofa.” The company plans to get all Control VR systems out to people who pledge $350 or more by December 25th. A retail version is further out, but is expected to be ready for the mass market in 18 months. Some of the world’s biggest companies have placed big bets on virtual and augmented reality, but while the visual experience is already impressive, controllers for the Oculus Rift and its contemporaries have lagged behind. Devices such as the Razer Hydra are frustrating and imprecise to use, while others such as the Virtuix Omni require vast amounts of living room space, leading Oculus’ Palmer Luckey to lament the lack of a top-quality input system for his company’s machine. Control VR’s system certainly appears smaller and more precise than its peers, but it’s yet to be seen how quickly the virtual reality community will warm to it. In the meantime, the company plans to show off the system at next week’s E3 expo, offering developers the chance to get their hands, as well as their heads, into their video games.